Don’t cut grass too short; it leaves your lawn vulnerable to diseases and weeds. A sharp mower blade cuts grass cleanly, while a dull blade tears the grass, creating openings for pests and diseases. Leave grass clippings on your lawn whenever possible. It’s called grasscycling. Sure, you know how important it is to water your lawn regularly, especially during the scorching summer months. And to spread fertilizer to encourage lush, green growth. But when was the last time you gave a serious thought about proper lawn-mowing techniques? There’s a lot more to this than a mad dash in the grass before you can reward yourself with a cool beverage. For instance: Do you know the optimal height of your lawn? (It varies by type of grass and by season.) And how long has it been since you had the mower blades sharpened? We mentioned lawn-care basics in a blog post here several months ago, but now it’s July, and your lawn is at its most vulnerable under the fierce Northern California sun. 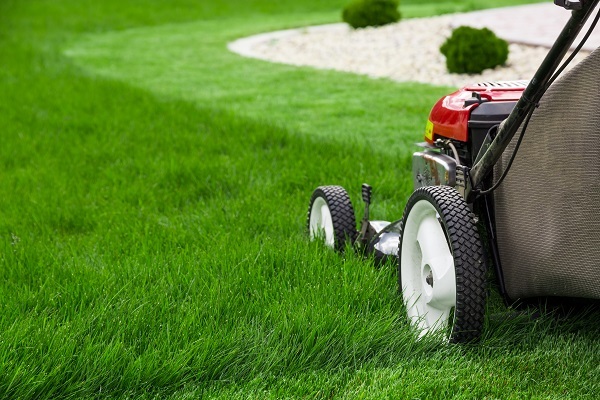 The following lawn-mowing tips can help keep it healthy. Cutting the grass too short leaves your lawn vulnerable to diseases and weeds. Exposed soil allows sunlight to reach weed seedlings and give them a boost. Grass that is regularly cut too short has a poorly developed root system, making the lawn susceptible to serious damage from drought or high temperatures. Time lawn-mowing jobs so that you never remove more than one-third of the total leaf surface of a single blade of grass. Adjust the mower height throughout the growing season, allowing the grass to grow longer in the summer. Taller grass helps shade soil, which prevents weed growth and slows water evaporation. Taller grass also develops deeper roots, which creates a lawn that can better withstand drought. In areas subject to winter snowfall, cut the grass shorter for the last mowing of the season to help prevent snow mold from forming on grass. In general, let grass grow a bit longer in shady areas of your lawn. Keep the mower blade sharp to get the best results. A sharp blade cuts grass cleanly, while a dull blade tears grass, creating a jagged, uneven edge. These tears create openings for pests and diseases. A lawn that has been cut with a dull blade develops a whitish or brown hue as the tips of individual grass blades die back. Sharpen blades at least a few times during the mowing season. Wait for your lawn to dry before mowing. Cutting wet grass can result in an uneven cut. Try not to mow the lawn during the heat of the day. Grass loses more water and recovers much more slowly than if you mow during the cooler part of the day. Use care when mowing on a slope, even a mild one, and never mow a slope when grass is wet. That creates slippery footing that can lead to serious injuries. Mow in a different direction every time you cut the grass. The blades will stand up straighter, since they typically lean in the direction you mow. Leave grass clippings on your lawn whenever possible — it’s called grasscycling. It not only saves you time (no more bagging clippings), but it also saves money (no more yard-waste bags or fees). Grass clippings break down quickly and can provide up to 25 percent of your lawn’s fertilizer needs. If you’re in the market for a mower, consider a gas-free and fume-free option. Battery mowers are quieter than traditional mowers, and most models offer sufficient power to cut typical yards. If you have a large yard, you might want to purchase an additional battery. Look for a model that allows you to remove the battery for charging.